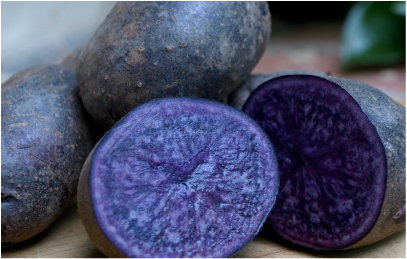 The Purple Majesty has a dark purple skin and vibrant purple flesh. Rich in antioxidants, which have been shown to boost the immune system, and aid in the prevention of certain cancers. ​How we like it: Great roasted, mashed, baked, twice baked, or a fun & beautiful twist in a potato salad. Some people are intimidated by the color, but it's one of our family favorites and a great party pleaser. The Red Sangre has a thick red skin and bright white flesh. ​How we like it: We love mixing the Sangre with the Desiree to make the best dirty (with skin) mashed potatoes. ​The Red Desiree has a light red / pink waxy skin with a light yellow buttery flesh. ​How we like it: We love mixing the beautiful Desiree with the Sangre to make the best dirty (with skin) mashed potatoes. Also great roasted or in potato salad. The Yellow Jelly has a light yellow waxy skin and light yellow flesh similar to a Yukon, but we like it better because it's creamier and less starchy. ​How we like it: We love these roasted, mashed, baked, twice baked, in potato salad, or in soup.